This makes me happy. 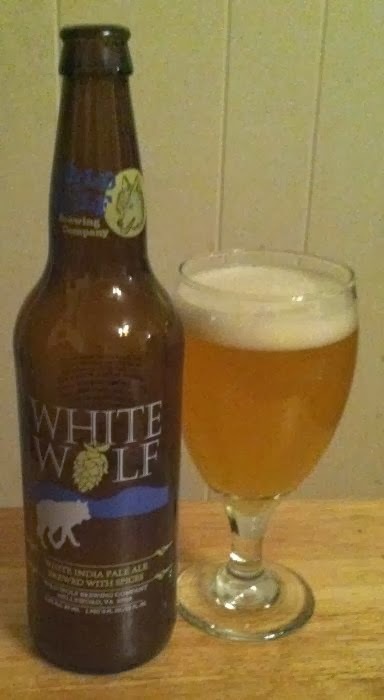 White Wolf is a beer from Wild Wolf Brewing, a brewery that's a stone's throw away from my house. It's local, it an interesting hybrid (kind of n IPA wheat beer combo), and it's really good. 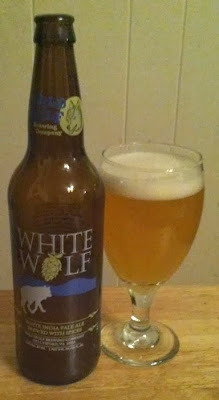 White Wolf is a hazy yellow with a pile of foamy head that fades quickly and leaves no lace to speak of. The aroma is like a spicy hefeweizen with some lemon zest and floral hops. And the flavor is just fine. Slightly sweet and wheaty with a bitter, grapefruit and grassy hops finish. At 5% ABV, this is fine for session drinking. I can't remember exactly what I paid for this at a nearby Wal-Mart, but it wasn't much. This could become my lawnmower beer of choice this summer. And I think a country drive to Wild Wolf's restaurant and tap room is probably in my immediate future. The menu and setting seem like something my girlfriend would really enjoy, too. This brewery appears to be so well established and has so much to offer, I have no idea how they've been off my radar for so long.